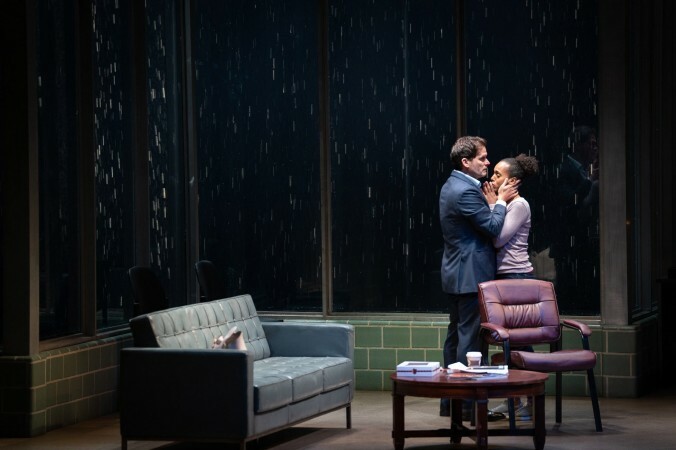 It's hard to imagine a play more relevant to today's political and social circumstances than American Son. This show, written by Christopher Demos-Brown and deftly directed by Kenny Leon, examines what it means to be the mother of a black son in modern America. Kerry Washington leads the cast brilliantly, but each member is perfect for their role. The show isn't easy to watch -- and it shouldn't be -- as it causes every audience member to actually reflect on life in America today. 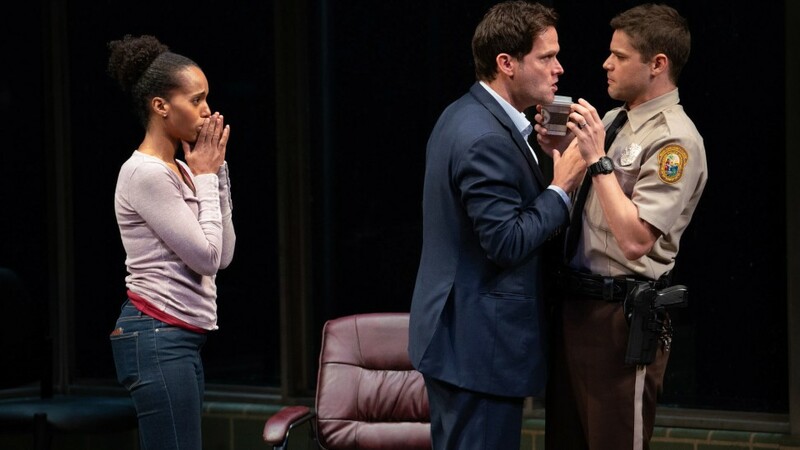 The show opens onto a Florida police station in the early hours of the morning as Kendra (Kerry Washington) tries to get information from Officer Paul Larkin (Jeremy Jordan) about what they know about her missing eighteen-year-old son. 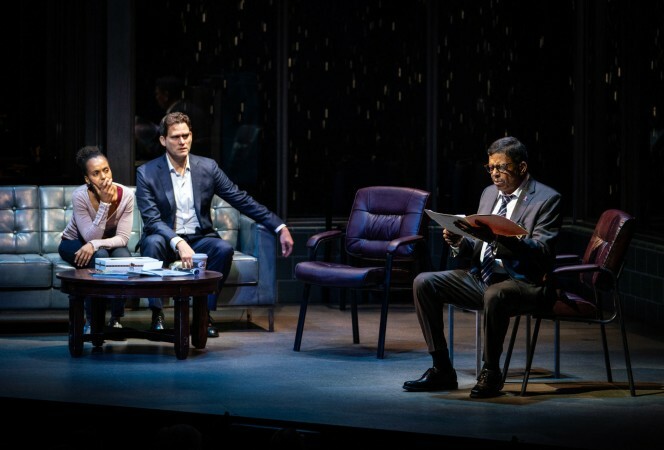 Larkin's questioning soon reveals his racial bias, but it's laid plain when he proves much more helpful to Kendra's white husband Scott (Steven Pasquale). However, little information is available and Kendra and Scott's frustration escalates as they deal with Lieutenant John Stokes (Eugene Lee). Kendra and Scott begin to argue not just over how they've raised their son but also about what caused their own separation as things start to unravel. The question of whether or not their son is in police custody or injured hangs in the air for almost the entirety of the show. The show is a succinct eighty-five minutes long but doesn't feel short. In fact, by the time it ended, I felt like I couldn't handle any more stress. Kerry Washington is stunning as the concerned mother Kendra who is eager to demand answers about her son's whereabouts. Unlike Kerry's character on Scandal, Kendra has little tact or patience in dealing with the men. She spends the show in one outfit with her hair slicked back into a ponytail. It's not a glamorous role -- and all the more powerful for it. 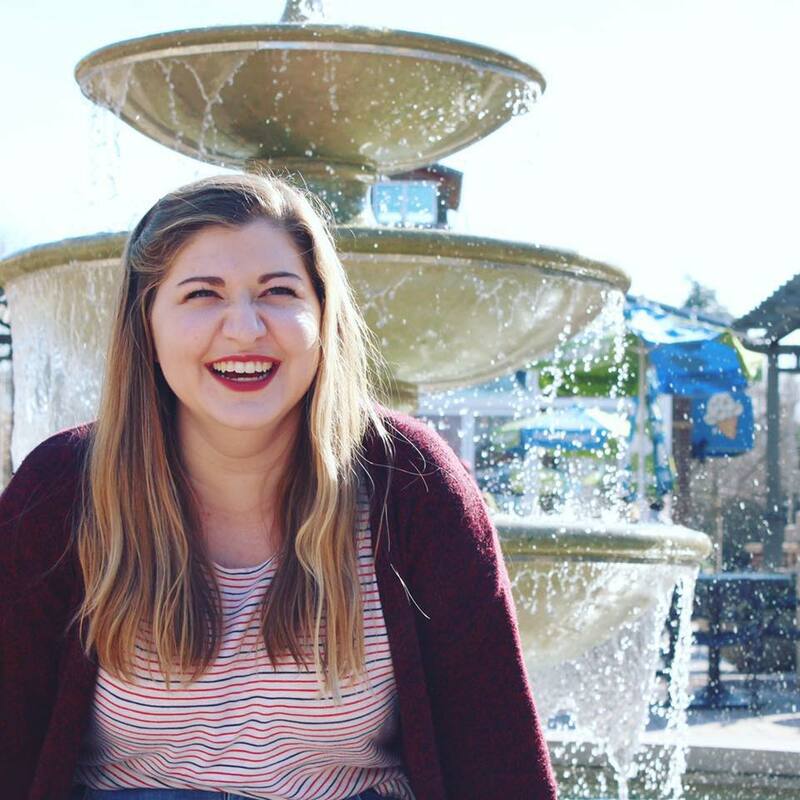 It's a powerful portrayal and feels heartbreakingly authentic especially as Kendra starts to fall apart towards the end. Steven Pasquale is equally well cast as Kendra's husband Scott. He perfectly portrays a charisma that covers his true personality until he begins to criticize Kendra for the way she has raised their son since their separation. This duality makes him feel all the more real. Officer Paul Larkin is a very different role than the ones we're used to seeing Jeremy Jordan in, showing off his versatility as an actor. Though it's not a large role (Kerry Washington is very obviously the lead of this cast), he manages to make it very memorable. Similarly, Eugene Lee does a splendid job as Lieutenant John Stokes and the conversation between him and Kendra is one of the parts that has stuck with me most since I saw the show. 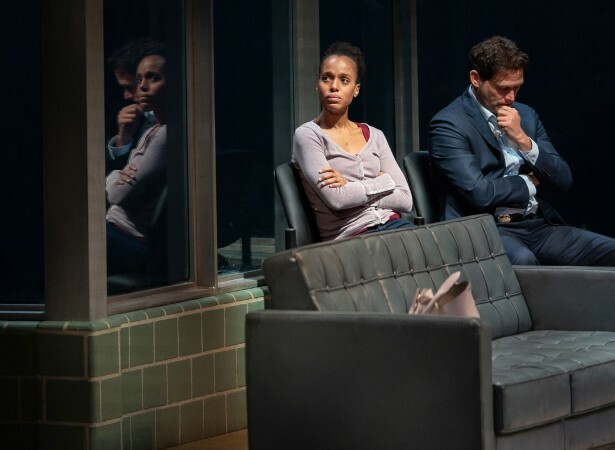 The show's set, by Derek McLane, is so realistic and thorough it almost seems more like a movie or television set. The whole show takes place on the one set with continual action but they make great use of the rather large space. The show has a chilling message about the truth of raising a black son in America. It's impressive how the character of the son permeates the show despite never appearing onstage. I would recommend that everyone who can should go see this play, but especially anyone who liked the recent film The Hate U Give as it deals with some of the same issues of racism and police violence. It's a powerful piece that demands attention -- and that I wouldn't be surprised to see at this year's Tony Awards. American Son is playing at the Booth Theatre until January 27.